With Production demand growing rapidly for Injection Moulded parts, Quantum Mouldings turned to Composite Integration Ltd for Exceptional engineering support by practical experience and has purchased Two Ci-Ject zeros. 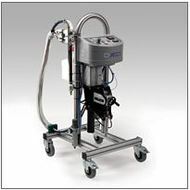 These machines includes accurate electronic pressure control allowing it to be used for both RTM and vacuum processes. The ‘Zero Plus’ option allows additional control functions. 3) Available with mix ratios to suit polyester/vinylester, epoxy or phenolic systems.